The Intergovernmental Panel on Climate Change (IPCC), a UN body of international scientists that review climate change science, have released their most recent report assessing the feasibility of limiting mean global temperature rise to below 1.5°C, the aspirational goal set by the Paris Agreement. The report shows that it is indeed possible to stay below 1.5°C and that people, ecosystems and the planet will be better off for it, but it requires transformational change now, away from fossil fuel and toward renewables. While diplomats were negotiating on the final text of the report, line by line, we decided to put together a People’s Dossier on 1.5°C, where we connect the dots between temperature increase, climate impacts and the need to stop fossil fuel infrastructure. In the Dossier, we tell the stories of 13 communities worldwide, fighting on the frontlines of climate change: from young Pacific Islanders trying to stop the Adani mega-mine to fishermen communities in Africa battling against new coal plants; from the struggle to stop a gigantic gas pipeline among the olive groves of Southern Italy to the landowners to people putting solar panels on the route of the Keystone XL pipeline. These are some of the people that have been pushing for that transformational change; the IPCC confirmed they’ve been right all along. According to the IPCC, the pathways consistent with a 1.5°C limit require cutting emissions in half by 2030, with the share of solar, wind and hydro energy increasing 60% by 2020 to provide between half and two-thirds of total energy by 2050. Removing carbon from the atmosphere by planting trees can give us the extra boost needed to quickly draw down CO2 concentration in the atmosphere without the massive deployment of carbon capture and geo-engineering technologies, most of which are unproven, were never implemented on a large scale and carry significant risks. The hard truth is that we can’t engineer our way out of the climate change mess. 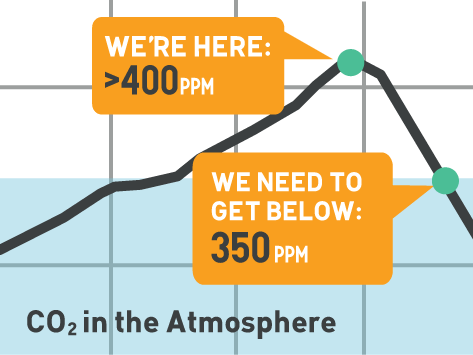 We have barely twelve (but more conservative estimates say less than three) years of emissions as usual before we exceed our carbon budget, that is the total amount of CO2 we can still put in the atmosphere to have a decent shot at limiting global warming to 1.5°C. The sooner and more quickly we cut emissions, the better our chances of meeting this ambitious goal. Or, to put it in clearer terms, every year we waste debating the obvious halves our chances of staying under 1.5°C. This reality is technically possible – last year, a team of researchers developed 100% renewable energy roadmaps for 139 countries. A global conversion to renewable energy sources can deliver a net gain of over 24 million jobs worldwide and prevent 4.6 million premature deaths yearly. It will eliminate over $20 trillion in air-pollution costs and almost $30 trillion in climate costs by the year 2050. Such a just transition will stabilize energy prices and increase access to energy by decentralizing power. The fossil fuel industry’s corporate hold on governments is the problem and their focus is solely on increasing their profit margin and externalising costs, which means the communities who are least responsible for it bear the brunt of its impacts. These include indigenous communities and poor people of colour. Yet the impacts are now being felt everywhere by everyone with only 1°C warming. This year is on pace to be the fourth warmest ever and has demonstrated there is nowhere to hide. We have witnessed over 4,000 heat-related deaths in Pakistan and India, as well over 300 deaths due to flooding and heat in Japan, one of the most industrialised countries in the world. Let’s use the IPCC report to strengthen our resolve to take action and use the climate crisis as an opportunity to create a more people-centred world that is in tune with mother earth. If ordinary people of all walks of life stand up to take extraordinary action, we can rebuild our economies to be carbon-free and make sure they work for all and leave no one behind. This, we believe, is our best shot at securing lasting change and creating the right momentum to secure, by 2020, a fast and just transition to a more equitable, fossil-free world. I hope that the stories in the People’s Dossier on 1.5°C will inspire you to join the movement, if you haven’t already. This is one big existential fight, and we might be short on time, but it’s up to each one of us to decide what we want to do with the time we have. I say we try and change the world.